Last week we asked the question, "Does prayer work? Does prayer make any difference?" We noted that prayer works in at least two ways: First of all, prayer changes us. As we pray, as we turn our thoughts toward God -- his power, his majesty, his faithfulness, his accomplishments -- our perspective changes. So that as we pray, God joins our heart to his, he gives us grace to help in our time of need, he changes our thoughts and our attitudes. In addition, prayer changes the world around us, not because our prayers change God, but because God has ordained that he will work through our prayers. And I suggested that the way God works through prayer is not fundamentally different from the way God works through preaching, or witnessing, or service: in each case, we could accomplish nothing unless the Holy Spirit works in the hearts of those we serve. So what kind of prayer works? As we thought about these words of Paul, we noted that this passage provides us with seven lessons for effective prayer, seven lessons that we need to take to heart if our prayers are to work. 7. Pray in accord with God's promises and gifts. This morning, we will elaborate on these lessons for effective prayer, particularly the second: using all types of prayer. I'll mention seven types of prayer that we might use. In addition, we'll discuss using all four parts of prayer: Adoration, confession, thanksgiving, and petition. Like last week, some of these points I will emphasize while others only mention; please note them all down, and try to put them into practice this week. So let us begin by examining our use of the four parts of prayer. I well remember my first week teaching secondary school in Kenya in 1977. My 2nd or 3rd day at the school, I had some business with the headmaster. I walked into his office, saw that he was busy, so just blurted out my request for additional math books for my students. The headmaster looked slightly pained, then asked me, "So how are you this morning? Are you settling in well? And your parents, have you heard from your parents? How are they? Those questions were a polite reprimand to me. You see, in most of Africa it is exceptionally rude to make a request of a person as soon as you enter their presence. You must first greet the person, ask about their family and children (and their grandparents and their neighbors!) and only after all these preliminaries make any request. The idea behind this custom is that the two of you have a relationship, and that relationship is more important than any use you might have for each other. You care about each other, you are concerned for each other first and foremost. Once you have established that through your greeting, then you can make a request. * When Hezekiah confronts the likely destruction of his nation, as the most powerful military force in the world is about to attack, he begins his prayer: O LORD, the God of Israel, enthroned above the cherubim, You are God, You alone, of all the kingdoms of the earth. You have made heaven and earth. These prayers do not have 10 minute long invocations. But they do begin by acknowledging who God is, they begin by reminding the speaker of some of the characteristics of the God whom we address. They also, like the African custom, establish the relationship between the speaker and God. Our prayers should do the same. * His creative power -- think through the mighty power of God as evidenced by his creation. My oldest son, Jonathan, gave me a good example of this last week: Given present estimates, if all the stars were divided up among all the people on earth, how many stars do you think each of us would receive? Ten? A hundred? No: Two Trillion. Two trillion stars for every man, woman, and child. That is the kind of God we have -- a God of unimaginable power, a God who has created unimaginable wealth. Let us now briefly consider confession. When we praise God, we are remembering who God is; when we confess, we are remembering who we are, how weak we are; we are agreeing with God concerning his statements about our actions. * Group confession: In addition to our personal sins, we need to confess sins committed by groups with which we are identified. If you continue reading Daniel's prayer, you find that he is confessing the sins of the Jewish people, even though he was not personally guilty of those sins. We too need to be cognizant of the sins committed by our families, our nation, our race, our church. * Second, while most confession has to do with sin, we also need to confess before God our inability to accomplish anything without him, our lack of power to accomplish anything of eternal significance. This, again, is agreeing with God concerning his statements about us, and thus is logically a part of confession. Consider it all joy, or "pure joy" as some translations put it, when you face trials. Do you consider trials to be a joy? James is not saying here that we should jump up and down, saying, "Oh, Goody! A Trial!" Rather, he is saying that we should have a quiet confidence that God will use these trials for our benefit, and the benefit of others who see us encounter trials with this attitude. Anyone can be thankful and joyful when things are going well; when we are thankful and joyful even in the midst of trials and difficulties, we stand out from the world around us, we are letting our light shine. Let me challenge you: Commit yourself right now to thanking God for the next five disagreeable things that happen to you. And let me know how it goes . . .
First, acknowledge that "No" is the best answer for some of our petitions. Amy Carmichael, who spent over fifty years as a missionary to India, told the story of her earliest memory. Amy's mother taught her about prayer when she was three. And Amy believed with a child's simple faith that all her prayers would be answered. Now, the desire of her heart was to have beautiful blue eyes instead of her own deep brown eyes. So she prayed one night, "Oh, Lord, please, make my eyes blue tonight!" And she went to sleep with full confidence that her eyes would be blue in the morning. When she woke up, she immediately ran to the mirror to look at her pretty blue eyes. She looked -- and was devastated. God had let her down. Now, in many cases we never know why God says, "No." But sometimes we find out. Amy believed in her later years that she knew why she had to have a dark complexion and the accompanying brown eyes. In India, she was able to dress like the locals and walk through the city streets without calling attention to herself. That would have been impossible had she been blonde-headed and blue-eyed. So when we get no for an answer, we should thank God, and believe that he is working all things together for the good of those who love him. Second, we can be confident that the answer will be "Yes" if our petitions are based on the promises of God. This is why Scripture prayers can be so effective -- we are basing our requests on God's explicit promises. Now, it is ok to pray for cares for which we have no specific promises -- we are instructed to take our concerns to God, whatever they may be. For those requests, however, we need to be ready to acknowledge no for an answer. But when we pray based on a specific promise, we can KNOW that God will answer in the affirmative. For example, when we are suffering through a trial, we can pray that God would use this testing of our faith to produce endurance in us, to perfect us, to make us complete, so that we would become like him. And we can know that God will do so. Finally, our petitions should include asking that God would be recognized as holy and just, praying that God's will would be done in this world and that the world would acknowledge him. This, of course, is part of the Lord's Prayer: "hallowed be your name, your kingdom come, your will be done on earth as it is in heaven" -- but how often do we pray about this topic other than when we recite that prayer? I encourage you to include this most important petition in your prayers this week. So we have considered Adoration, Confession, Thanksgiving, and Petition. 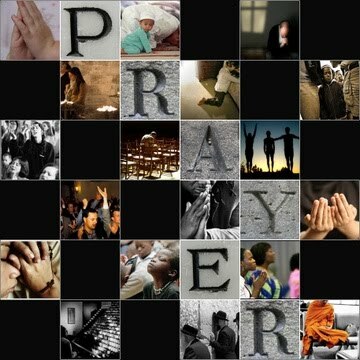 I encourage you to use all of the parts of prayer. Now let us turn our thoughts to different types of prayer. I will mention seven types of prayer, discussing only the first in any detail. * First, to learn how to praise God. Praise is usually the weakest part of our prayers. Asking God for things we think we need is relatively easy. We may not like to confess our sins, but we can always think of what we have done wrong. And we may not have a thankful heart, but with some reflection we can readily think of things for which we should thank God. But praise is more difficult for most of us. The Bible is full of wonderful examples of praise; praying through these examples serves as effective praise while we do it, and teaches us how to praise God when we don't have a Bible in front of us. * Second, using Scripture gives us examples of how to pray for others. Last week in Sunday School we used Paul's prayers in Ephesians 1 and 3 to pray for others -- this is a particularly powerful way to pray. * Third, God speaks to us through his written word. By praying through the Scriptures, by knowing the Scriptures and having them right on our lips, we put ourselves in a position to hear God as he speaks through his word. There are different ways that we can use the Scriptures in our prayers. We can simply read a passage prayerfully. Alternately, we can change the pronouns or the names so that the Scripture is specifically relevant for the case we are concerned about. Third, we can use the Scripture as a starting point, and elaborate on the points brought out as we pray. O Lord, my shepherd, our guide, our protector: Because we belong to you, we will never lack anything we need. Lord, help us to believe this and act upon it when the circumstances of our lives seem to indicate otherwise. My Shepherd, you make us lie down in green pastures, in places of abundant nourishment; you provide us with safe and quiet places to rest, so that we might be restored. Thank you, Lord, for guiding us in your paths of righteousness. Lord, without your guidance we would constantly be losing the path. Keep us on your paths, O Lord. Father, here is a mystery: we can ask "For your name's sake!" Lord, thank you that you choose to glorify your name through such weak and unworthy vessels as those of us worshiping you here this morning. Lord you are our shepherd even when -- especially when -- we are in frightening situations, when it appears that everything we depend upon is falling apart. But Lord, we will not fear if we draw close to you, if we acknowledge that you are with us, armed to defend us from every evil attack and equipped to keep us on the path. Your discipline and protection comfort us, O Lord. Lord, we know that you will honor us in front of those who have opposed us, that you will lift us up and exalt us, providing us with riches that we cannot imagine and do not deserve. You have given us a foretaste of this by the gift of your Spirit, as you have anointed us; the riches that you give us are worth more than we can imagine; we have a superabundance of good things. Our shepherd, your goodness and your lovingkindness, your covenant love, will follow us and accompany us every minute of every day of this life on earth. And, praise you my Lord, each person here who knows you as Savior and Lord will delight in you for all eternity in your presence. Thank you, our Father. Amen. I heartily commend this form of prayer to you. Commit yourself to taking a block of time and praying ONLY this way. I believe it will open the Scriptures to you, help you to hear God, and make your other prayers that much more effective. While the Scriptures are the best tool to use in our prayers, other writings by Christians can be helpful also. In the book A Life of Prayer Edith Schaeffer gives numerous examples of her own use of the Scriptures for prayer, along with examples of prayers of other Christians that she has used. Using such prayers once a week or so can help us to get out of the rut of offering similar prayers every day. * Faith is cooperating with God in changing me rather than taking refuge in piously berating myself. * Faith is refusing to feel guilty over past confessed sin, when God, the Judge, has sovereignly declared me pardoned. * Faith is accepting the ordinary as God's best for me when I want to be special. * Faith is accepting the truth that despite the wreckage I've caused and grieved over, God who has wiped the slate clean delights in me. * Faith is having the confidence that God will take the bad choices others have made that affect me and use them for my ultimate good. * Faith is taking my eyes off my good self, or my bad self, or my wounded self, and keeping them on Himself. Taking one of these sentences, meditating on it, and praying to God concerning our own need for this type of faith can be deeply rewarding. We can also pray for others to have this type of faith. I commend that to you. Has your mind ever wandered while praying? You are saying in your mind, "Oh, God, I praise you for your mercy and your lovingkindness . . . now how did the Celtics blow that game last night? I just don't understand how professional basketball players . . . Oh, Lord, sorry, I praise you . . ."
God is the only person we try to address in our heads; we have little practice in speaking this way, making it is easy to lose focus. Silent prayers are often appropriate when we are in the presence of others, but when alone I suggest that you pray aloud. One author has stated, "Praying out loud controls 90% of mind wandering." I do not believe that Daniel would have prayed what is recorded for us in Daniel 9 silently; though he was alone at the time, this is a spoken prayer. So I encourage you this week to try saying all your solitary prayers out loud. Daniel eventually wrote down his prayer in chapter 9. I have been writing many of my prayers for the last three years, and I would have to say that this is the single most helpful change in my prayer life. Now, I write professionally, so when I am positioned in front of a computer with my hands on the keyboard, it is natural for me to be focussed on my work. I think simply assuming the position is helpful to me, in keeping me from allowing my mind to wander. In addition, I have found that writing especially helps my praise time. Typing slows me down just enough that I can't simply rattle off fifteen attributes of God in a few seconds and go on to another part of prayer. In his book Too Busy Not to Pray, Bill Hybels suggests writing your prayers and then reading them aloud. I rarely do this, praying instead as I type. Try it both ways at least once this week, and see how this affects your prayer time. Singing during a prayer time can be quite effective, especially as a form of praise. And there is clear biblical precedence, as the Psalms and other parts of the Old Testament (such as Habakkuk 3) were originally written to be sung. Make use of the praise songs we sing in church, make use of hymns, offer up your own creations. Your voice doesn't have to be good, and your songs don't have to be great pieces of music. God is delighted when our hearts are turned to him in prayer, and singing adds another dimension to our prayer life that is especially helpful at turning our hearts to him. In addition, singing as part of a performance of a great work of Christian music can be a deeply prayerful experience. Many of you know that God turned my life around while we were living in Kenya in the early 1980's. During the fall of 1984 I was practicing Handel's Messiah with the Nairobi Music Society, an excellent 100-voice choir. Unfortunately, the concert was to be performed on a Friday night, the very night of our departure for the States. Nevertheless, I participated in the practices all fall because of the joy of singing this great piece of music. In mid-November, the airline on which we were flying changed its flight schedule, forcing us to delay our departure until Saturday night -- and allowing me to spend my last night in Nairobi singing praises to God. For me, that night was incredibly meaningful -- feeling that God as a special gift had made the arrangements so that I could sing, thinking of all that He had accomplished during my three years in Kenya, and ending with the most glorious chorus ever written: "Worthy is the lamb that was slain and hath redeemed us to God by his blood to receive power and riches and wisdom and strength and honor and glory and blessing! Blessing and honor, glory, and power be unto him that sitteth upon the throne and unto the lamb forever and ever! Amen! Amen!" The entire 2 1/2 hour concert was one long prayer for me. In addition to praying through songs written by others, we can effectively pray to God through our own creative expressions. This can include our own musical compositions, our artwork, our writings -- praising God, bringing glory to him through our creativity can be one effective method of prayer. Clearly masterpieces bring glory to God, but our own songs written to express our thoughts to Him can also please Him, just as three-year-old Joel's music and drawings which he offers to me bring me pleasure. Finally, I would like to suggest that we also effectively praise God when we honor him through excelling in areas in which he has gifted us. This can be in our ministry, in our work -- as Doug discussed a few weeks ago when preaching on the first part of Ephesians 6:5-9 -- or in athletic endeavors. One of my favorite expressions of this idea comes out in the Academy Award winning film, Chariots of Fire. The film tells the story of Eric Liddell, who won the 400 meters at the 1924 Olympic games. Eric was born in China, where his parents were missionaries, and knew he was called to missionary service in China. In the film, Eric's sister Jenny confronts him concerning the amount of time and energy he is expending on his running, as she suggests that he is forgetting his calling. Eric replies, "Jenny, I believe God made me for the purpose of serving in China, but he also made me fast. And when I run I feel His pleasure." When we work to the best of our abilities by God's power in whatever we do, when we give Him all the glory for whatever we accomplish, we are praising Him in a most effective way. And this also is a type of prayer. So in the last two weeks we have learned much about prayer. The question now is: What will you do? Will you put these truths into practice? In Psalm 27, David tells us that the Lord said to him, "Seek My face." And David's heart replied, "Your face, O LORD, I shall seek." Seek his face! Will you seek the face of the Lord? My three-year-old Joel will sit on Beth's lap, reach up with his hands, put one on each of her cheeks, turn her face toward him, look dreamily into her eyes and say, "I wuv you Mommy." He seeks her face, he longs to stare one on one into her eyes. We are to do the same with God. God commands us to seek his face, and tells us that we cannot live the Christian life or experience true joy unless we do so. And he promises that persistence in prayer will change both us and the world around us. We must taste in order to see, we must reach out to him in prayer -- regularly, persistently -- and then we will see that the Lord indeed is good. There is true joy to be found in tasting the Lord's goodness. So I hold out to you that promise of God: If you persevere in prayer, you WILL see that the Lord is good, you will see the impact on yourself and others of your prayer. But I warn you: it won't be easy. Martyn Lloyd-Jones said, "Everything we do in the Christian life is easier than prayer." We are in a war, and prayer is one of our most effective weapons. So Satan will fight us every step of the way. But because we are in a war, because the body of Christ depends on each one of us holding up our part of the front line, we need to strengthen our feeble arms and weak knees, we need to discipline ourselves so that we regularly, continually turn in active dependence to the Lord. So I encourage you: Taste and see that the Lord is good. Commit yourself to using at least one of these types of prayer today, and another this week; commit yourself to using all parts of prayer. Seek his face. Our Lord and Father, you who have reached out to us and given us such great and precious promises, you have told us that we have the tremendous privilege of approaching your throne of grace boldly, with confidence because of the blood of Jesus shed for us. Our God, we confess that we have neglected to do so, that we have allowed the Enemy to divert us from this most important task. Lord, may we believe that you have ordained to work through prayer; may we then act on that belief even today. And may Community Bible Church become a community of believers who are devoted to prayer, so that we might be effective ambassadors for you in this hurting world. Addendum added 5/28/01: Another suggestion for prayer, which God has used mightily in my life since I preached this sermon: Try to find an isolated spot that you really love, and regularly go there to pray. I fought this for many years: "I should be able to pray anywhere! I'm just giving in to weakness if I have to go some place special to pray effectively." But that thinking is wrongheaded. For I could say the same thing about my relationship with my wife, Beth: "We don't need to go anywhere special; if our relationship is good, we can talk fine at home." Of course we can talk fine at home. But our relationship benefits from regular special occasions when we go somewhere we both enjoy, and relate to each other in that special context. Just so, your relationship with God will benefit if you take the time to go some place you particularly enjoy (God enjoys all places!) and spend time with Him. This is a phenomenal blog. I will return! Thanks for your incredible effort in putting this together. I am better today because of this.